Are you Making These 5 Common Dog Socialization Mistakes? Socializing your dog is something that you’ve been told not to neglect. No matter what you read on dogs or dog training, you’ll invariably find something about socializing your dogs. You’ve seen mentioned probably hundreds of times by me. 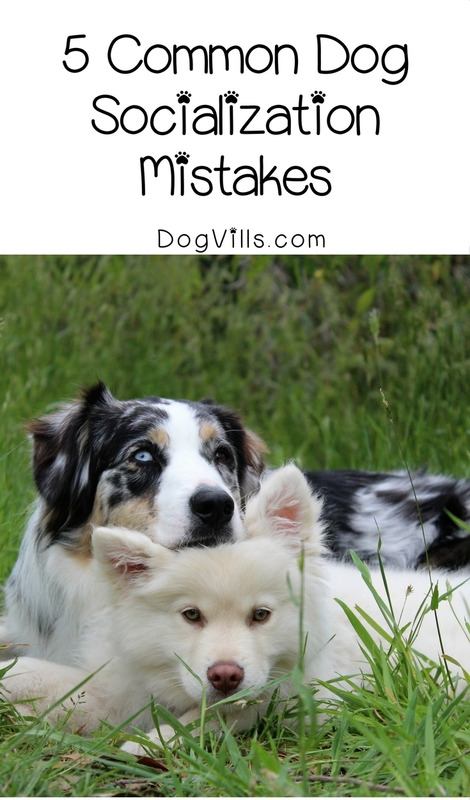 And I do my best to be specific, but I thought today, I’d address some of the most common dog socialization mistakes people make. When you know what not to do, it’s easier to do what you should. I’ve written about socializing dogs and how important it is. I’ve even given examples of how you should do it, but it’s possible to take things too fast when socializing a dog. So let’s look at these common mistakes. Go big or go home does NOT apply to socializing your dog. Of course, you want your dog to be around other dogs. That’s one of the biggies is socialization after all. But don’t dive right into taking your dog to the dog park or to another equally rambunctious dog-friendly area. You want to introduce your dog to other dogs in a positive way. So before you head out to a dog park, try something like introducing your pooch to a neighbor’s FRIENDLY dog for some easy going, one-on-one socialization. Foregoing training is one of the biggest mistakes you can make when socializing your dog. Socialization isn’t just about making sure your dog is friendly with other dogs. It’s also about making sure your dog is well-behaved when you’re out and about. You want to be sure your dog isn’t aggressive towards or fearful of other dogs and animals, but you also want to make sure your pooch doesn’t pee on someone’s leg or drag you down the street. It sounds ominous, but you need a strategy for what to do if your socialization attempts go sideways. Never take your dog out for a socialization excursion without knowing how you’ll get your dog out of a dicey situation should one arise. Basically, this boils down to ALWAYS having a mode of transportation handy and being near a door if possible. Never take your pup or young dog to a place where you cannot quickly and easily make a quick exit if needed. Here’s the thing about correction. It’s not for our dogs, it’s for us. It’s us imagining that our dogs think like we do. They don’t. If you’re out socializing your dog and he starts barking like a maniac at something new or starts to growl, don’t correct him. He’s afraid, and he won’t understand what you’re doing. Socialization will invariably result in some situations where your dog will become afraid and agitated. Don’t correct him and don’t coddle him. Ignore him. Do not reinforce the behavior. Sometimes in our quest to get our dogs on the right track, we go right for the biggies and forget the small things. Things like just walking our dog or taking them for a ride in the car can go a long way towards socializing your dog. It gives them new scenery, new sensations, and every so often, they see a new fuzzy creature. It’s easier than you think to avoid mishaps when socializing your dog. As long as you follow the above tips, you should be able to eliminate the most common socialization mistakes and be well on your way to successfully getting your pooch nice and comfy with the world. Did you already make any of these dog socialization mistakes? Share how your stories and tips below!